Socrates is a name often relied upon when historians want to invoke a notable person from antiquity. There is good reason for the fame and durability of this name. In both his life and his death Socrates (469–399 B.C.E. ) provided a model for wisdom and courage. Socrates spent his life in Athens, the city of his birth (470 B.C.E. ). Athens already had produced thinkers and artists of the highest order as well as an experiment in (limited) democracy that has continued to inspire and influence seekers of equality, freedom, and creativity through the centuries. 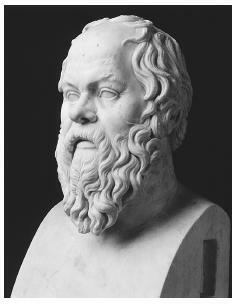 The bust of Socrates in the Museo delle Termein Rome displays the hearty features of a broad-faced, pug-nosed, thick-lipped, and generously bearded man. His friend Alcibiades teased Socrates by likening his face to that of a wild, sensuous satyr. Socrates not only accepted this comparison but added that he had better do more dancing to reduce his paunch. Humor came naturally to Socrates and, in fact, played a significant role in his philosophical method. Specific information about Socrates' life is sparse. It is believed that he was the son of a sculptor and a midwife. He followed his father's footsteps, working as both a stonemason and a sculptor. He also claimed to be following his mother's line of work, "by helping others to deliver themselves of their conceptions" (Durant 1968, p. 36). Socrates usually kept himself in good physical condition and earned a reputation as a soldier of exceptional stamina, as well as skill and courage. His marriage to Xanthippe produced a family but also her justified complaint that he spent more time gadding about and annoying people than with his wife and children. He enjoyed companionship, cared little about material possessions, and was considered the very model of a well-balanced person: moral, but too earthy to be revered as a saint. The Athens of Socrates' time enjoyed exceptional intellectual vitality. Almost every facet of life was open for discussion. Here philosophical issues were fresh, live, and compelling—the same issues that would later become weighed down by centuries of further speculation and commentary. The political establishment, however, did not necessarily cherish this free exchange of ideas. Some of these ideas could be dangerous to the institutions that kept the establishment in power. Socrates became the most adept and, therefore, the most fascinating and most dangerous asker of questions. The "Socratic method" is one of his enduring contributions to philosophical inquiry. He believed that everyone with a competent mind already knows the basic truths of life deep inside of one's being, even if unaware of possessing this knowledge. Socrates would educe knowledge through conversations guided by an unfolding series of questions. True education was educing—drawing something out of, rather than forcing something into—the mind. This dialect method was perfected rather than invented by Socrates. Zeno of Elea (born the same year as Socrates) had already introduced the art of questioning as a way to reach the truth. Socrates had the extra knack of making powerful people uncomfortable by undermining their assumptions with his deceptively simple questions. Bystanders found it amusing to see how people with exaggerated opinions of their knowledge became flustered as Socrates' casual, low-key questions eventually exposed their errors. The victims were not amused, however, and they did not forget. It is Plato's Dialogues that provide most of what has come down to readers through history about the life and thought of his mentor. There are no books written by Socrates, only his appearance as the main character in Plato's writings and, to a much lesser degree, in plays written during or after his life. There is no way of knowing for sure how much is "pure Socrates" and how much is Plato. The dialogues were not intended as fastidious reportage of actual events and conversations; they were imaginative riffs on ideas and people. Symposium, for example, takes readers to a banquet in which Socrates and his friends entertain and compete with each other to solve the mysteries of love. Plato's Dialogues offer episodes and scenes through which his philosophical points could be made through the characters themselves. His first generation of readers could separate fact from fancy, but this has become much more difficult for the following generations who lack insiders' knowledge of the political, historical, and philosophical milieu of Socrates' Athens. Plato's account of Socrates offers a remarkable vision of a society superior to any previously known in one of the most influential of the dialogues, The Republic. A rational, managed, and futuristic society is portrayed where even genetic selection and psychological testing exist. The resonance of this imagined society can be felt in many spheres of life in the twenty-first century, including the ever-shifting boundaries between science and science fiction. One of the early masterpieces of philosophy, this dialogue ranges from vigorous discussions of the nature of justice to the recesses of a shadowy cave where readers are challenged to determine the definition of reality. Neither in his life nor in his Dialogue appearances does Socrates demand overthrow of the establishment or express disrespect to the gods. However, his relentless questions raised anxiety and created enemies. The faithful soldier, the relatively faithful husband, the good companion, and the subtle and witty philosopher all were now in their seventieth year of life and awaiting execution. Socrates had inadvertently given his enemies an excuse for retaliation. The case against him was so insubstantial that it should have been immediately dismissed. He was accused of impiety, although he had never cursed the gods, and accused of corrupting the young, a charge so far-fetched that it was hard to keep from laughing out loud. Socrates believed that a teacher should not besiege students with a barrage of words but instead help people to discover and articulate their own hidden knowledge. What gave the accusations their power was the undercurrent of annoyance at Socrates' habit of raising questions that set too many minds to thinking and could possibly destabilize the establishment. He was blamed for the current state of unrest against the establishment and even accused of being a traitor. These were "trumped-up" charges that Socrates expected the court to overturn. Even when convicted, he could have avoided a serious penalty by saying the right words and admitting some fault. This he would not do: Instead, he stood before them unrepentant and free-spirited. Few of his fellow citizens had expected the death penalty to be enacted. Something had gone wrong with the process of rebuking this distinguished gadfly, and now they would have to go through with the embarrassing act of taking his life. Socrates quaffed the contents of the cup, described the changes occurring in his body—the rise of cold numbness upward from the feet—and died peacefully. At least that is the scene reported in Phaedo. Some doubt has been cast in late-twentieth-century scholarship. The medical historian William B. Ober notes, along with others, that Plato described an event he did not witness: He was too upset to see his friend's death. More significantly, perhaps, hemlock usually produces a variety of painful and distressing symptoms. Perhaps Plato sanitized the actual death to create a more acceptable memory-scene, or perhaps Greek physicians had mixed hemlock with a gentle sedative in the farewell cup for Socrates' journey to philosophical immortality. Ahrensdorf, P. J. The Death of Socrates and the Life of Philosophy. Albany: State University of New York Press, 1995. Brickhouse, Thomas C., and Nicholas D. Smith. Plato's Socrates. New York: Oxford University Press, 1994. Durant, Will. The Life of Greece. New York: Simon & Schuster, 1968. Ober, William, B. "Did Socrates Die of Hemlock Poisoning?" In Boswell's Clap & Other Essays. Medical Analyses of Literary Men's Afflictions. New York: Harper & Row, 1988. Plato. Apology, Crito, Phaedo, Symposium, Republic, translated by B. Jowett and edited by Louise Ropes Loomis. New York: W. J. Black, 1942. Stone. Irving, F. The Trial of Socrates. Boston: Little, Brown, 1988.